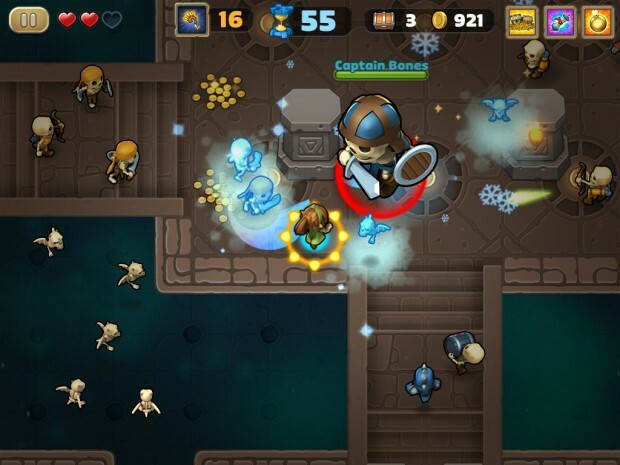 Storm Casters ($0.99) from Get Set Games – yes, the Mega Jump (Free) people – is a fun little take on the hack ‘n slash genre. It’s essentially Gauntlet meets the cinema classic, Crank. Players have a limited amount of time to rush through levels with hordes of enemies, before the portal that warped them in closes. 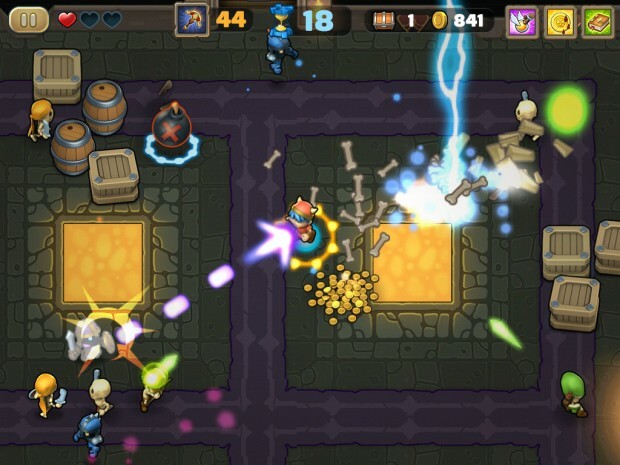 Thus, there’s not much in the way of dawdling about in levels, as it’s all about getting to the next room, fighting a boss, and going on before the timer runs out, collecting sweet loot upon the way to buy upgrades, so that the next run can progress further thanks to longer portal times, increased damages, and more potent card effects. And yes, there’s a card system in the game, but it is shockingly non-onerous. Gauntlet is the most apt comparison for this game because the player character shoots projectiles, and enemies come in massive numbers. Health is at a premium, so avoid damage as much as possible – there’s only one heart to start out with, even when character evolutions with larger heart counts happen, so one early mistake and it’s the end of that run. 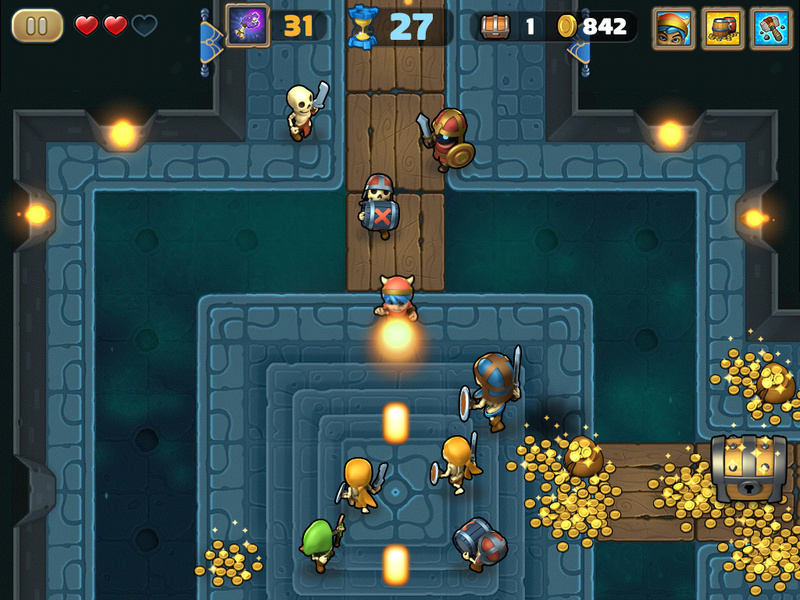 The game has been described as a roguelike, which it really only is in the sense that levels are procedurally-generated, but coins collected can be amassed over time, and it’s possible to build up a selection of cards. However, the cards, which offer positive effects like increasing a certain weapon’s spawn rate, or weakening enemies, have a new set of 3 cards drawn before each run. 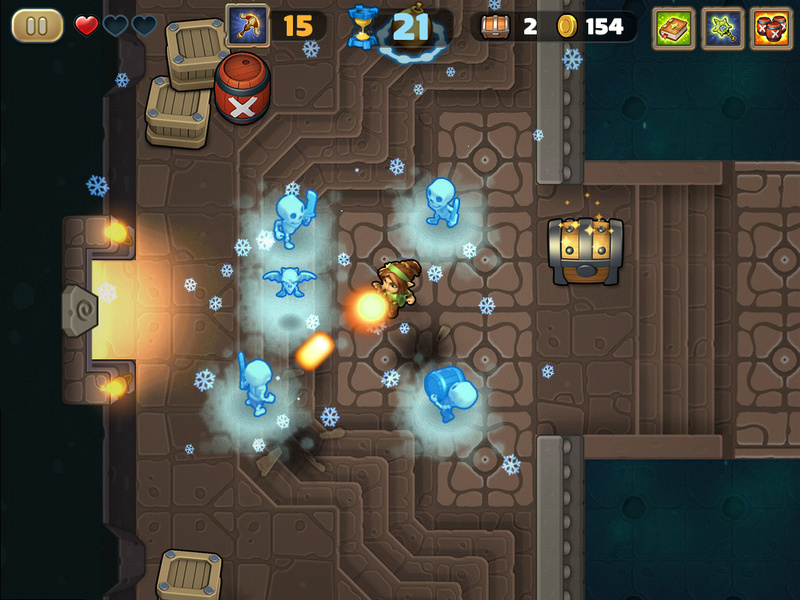 The game is structured in such a way that levels must be beaten two or three at a time to get to the next set, with the ability to replay earlier levels to get more loot: coins and treasure chests which contain more coins, the warp stones hard currency for buying new card packs, and just new cards outright. I find that I do best when I get a bit of momentum, so sometimes when trying to progress, I’ll go back to an earlier set of stages that I know I’ll survive, so I’ll go in to the next set with some ammo on a more powerful weapon and more health. Now, a card system, with packs to buy and an in-app purchase of $4.99 required to buy the premium pack of cards, seems like a sketchy system to have in a paid game. Thankfully, they shouldn’t affect players much. The card effects are all passive, and really, given the speed of the game, they just become part of the chaos that ensues. It’s a randomness meant to provide variety, not to be against the player in any way. So yeah, feel free to ignore the system entirely. As well, coins are handed out regularly (and it’s not possible to buy them), so really, the IAP is as optional as humanly possible in this game, and the coins and cards systems become fun parts of the game, rather than persistent elements to worry about. The game’s controls are a bit of a sore point. There’s an auto-aim option selected by default, which works well, but of course comes with the vagaries of auto-aiming, that it might not aim at the thing it should be aiming at, such as barrels to destroy, or a particular enemy. The dual-stick controls are okay, but feel a bit limited in the range of motion they provide, and given how fast the game is, the auto-aiming just winds up feeling like the superior option. There is limited MFi support, but with that same limited range of motion and with no way to navigate the UI or use items from the controller. After experimenting, I roll with the auto-aim firing because it best fits the pace of the game. And yeah, its fast pace is what makes this game so compelling. The constant rush to push forward, to fight through enemies and to defeat bosses before that portal timer runs out, that’s what fuels this game. It’s perfect for short sessions, but great for diving back in again and again, though, like any hack ‘n slash game it can get repetitive. But, in its repetitive basicness, it’s still kind of endearing. I have an idea what to expect from the game at any given point, and yet I have no problem jumping in for another frantic round. There’s not a lot of surprises, but I’m fine with that. It’s mindless fun with just enough character progression and customization to get me to care about loot, but shallow enough that I don’t have to worry too much about it. The cards are there enough to care about fusing them to get new ones, but not so much that I don’t feel the need to spend money on more warp stones. Really, I know what Storm Casters is: a turbo-speed hack ‘n slash game that’s kinda shallow, but knows it and embraces it.